This book is 496 pages. But don’t be scared! It’s really two books in one (making it a great bargain!). The first book is A Tale of Two Investors. It’s the fictional account of two friends, Conrad Soomer and Juan Tunavest, as they go through their 30’s, 40’s and 50’s. The decisions they make, the people they listen to, and the ideas they embrace lead to two very different sets of results. All the characters’ attitudes reflect composites drawn from the hundreds of investors Robert and Russ have worked with over the years. Though very entertaining and engaging (several readers have reported staying up all night to finish! ), the purpose of the story is to allow the reader to learn vicariously through the mistakes and successes of the characters. Many readers have told us they found the story to be both enlightening and inspirational. 1. 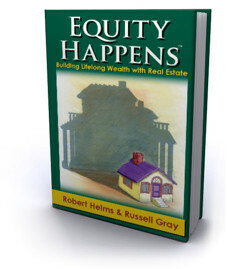 Equity Happens – Here, the case is presented for real estate as a wealth building vehicle. What is equity, where does it come from and what are the critical fundamentals of successful real estate investing? 2. The Good Deals – What does it really take to get started? How do you find a “good deal”? What can you do to improve your odds of success? 3. Helping Equity to Happen – Mark Twain said, “Don’t wait to buy real estate. Buy real estate and wait!” But there are lots of things you can do while waiting for values to rise over time. These techniques are even more essential when values dip. Even though real estate is considered a “passive” investment, you don’t need to be passive about growing your equity! 4. Education for Effective Action – It’s been said, “Knowledge is Power”. The Real Estate Guys would have to add, “when acted upon”. This section describes the why and how of developing your personal investment philosophy and strategy, which will become the guiding light for all investment decisions you make. There are no problem properties, only problem ownerships. Problem ownerships occur when someone buys a property that isn’t right for them. Developing and adhering to your personal investment strategy will prevent this from happening.